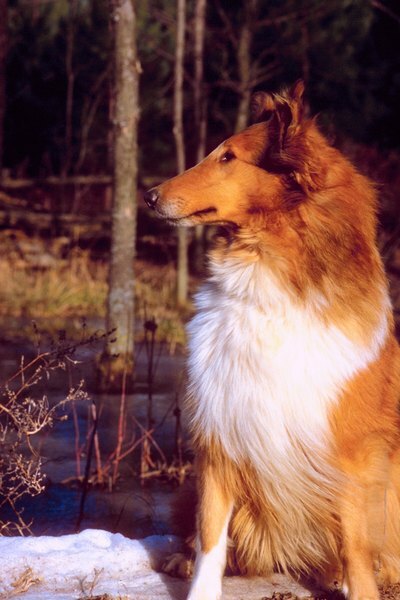 Lassie never had a bad hair day. Your rough collie's hair is his crowning glory. If he experiences hair loss, it could result from the usual suspects affecting all dogs -- flea or food allergies, mange -- or less common afflictions primarily targeting collies. Your vet performs tests to get to the bottom of collie hair issues. A hereditary condition in collies, dermatomyositis affects the muscle and skin of young dogs, with hair loss and skin lesions. While it can appear in puppies, it generally strikes collies aged 6 months and up, increasing in severity until the dog is 1 year old. Occasionally, the condition first appears in an older collie. Dermatomyositis ranges from so mild that some owners don't realize their collie is affected to truly serious cases involving permanent scarring and ulceration. Some collies also suffer from muscle inflammation, another characteristic of the disease. Mildly affected collies often improve spontaneously, with no further ill effects or treatment required. In the worst-case scenario, the collie suffers so much that euthanasia is the best option. Most cases fall in between these extremes. In order to make an accurate diagnosis, your vet must perform a skin biopsy. According to the Collie Health Foundation, the preferred treatment is pentoxifylline, a human drug that the U.S. Food and Drug Administration permits veterinarians to prescribe "off-label." Because of its hereditary nature, collies with dermatomyositis should be spayed or neutered to remove them from the gene pool. Although not only collies suffer from discoid lupus erythematosus, it's common enough in the breed to have received the nickname "collie nose." It's a pretty obvious problem -- your collie's muzzle and nose lose hair, while crusty, serum-leaking lesions occur. In some cases, your dog's nose might lose pigmentation. Your vet takes skin scrapings of the affected area to make a diagnosis. Treatment consists of steroids and keeping your dog out of the sun. The rare skin disease bullous pemphigoid occurs most often in collies and Doberman pinschers. Your collie might experience hair loss and skin lesions all over his body, but the groin area is usually most affected. According to the Merck Veterinary Manual, the affected skin "resembles a severe scald." Large blisters might also erupt. While your vet might prescribe a steroid such as prednisolone and the immunosuppressant azathioprine used together, your collie might require these drugs in high doses for a long time to keep the condition in check. Your collie's hair loss could result from other diseases and conditions, including hypothyroidism. Dogs whose thyroid glands don't produce sufficient thyroid hormone often suffer serious hair loss, with the hair falling out in patches. A thyroid supplement usually stops the problem. Atopic dermatitis results in hair loss due to allergy. Your vet determines through skin and blood testing what's triggering your collie's reaction.